This is old version Blossom Blast Saga 1.15.1 apk for Android, you can install it if you want to downgrade or install old app. It is top Casual apps from King. So, the flowers can bloom or disappear even if you don’t string them. It is because the blast will trigger the other flowers to bloom. The game is really addictive because it is easy to play. However, it will be more difficult in the higher level. You will play as the little bee that is making the flowers bloom and blast. There are 320 levels that you can play in this game. Those levels are divided into several different areas of play that will change the background of the game. Besides, it will become more challenging if you reach higher level that come with some obstacles like the weeds. In each level, you will get limited amount string action to use. If you run out of it before achieving points required to raise the level, it will be over. Then, you must replay that level. 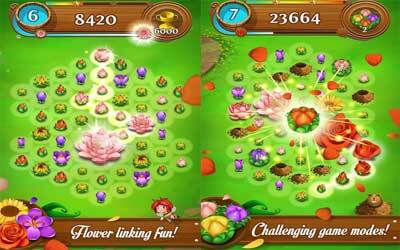 If you are interested to try Blossom Blast Saga for Android. Link 3 or more of the same color buds to grow the last flower in the chain. Join Blossom on her travels through Dreamy Meadow, Carnival Garden and beyond! Marvel at the natural wonders of this New Update! Steer through the flowing streams of Flower Flume, and then conquer the Nordic mountains of Lusekofte Paradise, two beautiful brand New Episodes! Introducing Streams: a new gameplay feature where floating logs will move with the current after each move dynamically changing the garden. Will you learn how to use this powerful new element to your advantage or will your blossoms be swept away by the challenge?